A balanced blend of Pre and Pro-Biotics as well as mycotoxin binding agents. Results can be seen in as little as 7 days. 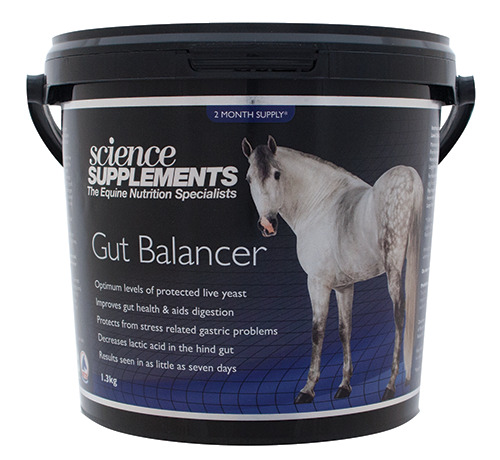 Science supplements Gut Balancer is one of the most advanced gut support products on the market. The key ingredient is Saccharomyces Cervisae, found here in a granules which are protected from the acidity of the stomach, resulting in more of the product reaching the hind gut in an active form. Saccharomyces Cervevisae is used here in combination with MOS (Mannanoligaosaccaride) and Betaglucans which help to stimaulate the growth of good bacteria. Studies have shown an improvement in faecal consistency in just seven days. Further information on this study can be found on the Science Supplements website.